Yep. Let’s not skirt around it in any way: we have another Wii U port here with Hyrule Warriors Definitive Edition. To be clear, I adored the Wii U, and I think it had a great library of exclusives that I spent hundreds of hours on. I don’t regret my purchase one bit. But it’s hard to get excited about Switch releases when I’ve played so much of it all before. But luckily, despite some extreme familiarity with Hyrule Warriors, Hyrule Warriors Legends and the Dynasty Warriors franchise and spin-offs, I once again found myself playing hours of Hyrule Warriors Definitive Edition again on Nintendo Switch. 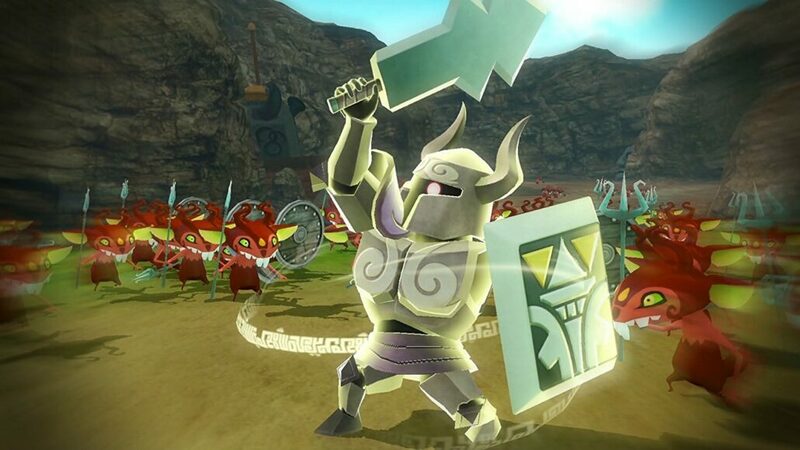 On Wii U I played through the main story, Legend Mode, and enjoyed my time with it. On 3DS, I enjoyed playing as Linkle, but the severely reduced enemy count and lack of one-console local multiplayer made the experience, frankly, less fun, even if I could play it on the go. On Nintendo Switch I’ve dived deeper into other modes than ever before, and the ability to play as Linkle and all of the DLC characters I missed out on gave me hours of fun, made even better by local multiplayer on the big screen – my favorite part of every Warriors title. Everything about my experience has reaffirmed something I thought back when I played Hyrule Warriors originally: this could be one of the best Warriors games, spin-off or not. It’s partially the Zelda fan in me that feels that way, of course, but it’s this basic Warriors formula that I’m such a fan of. You capture keeps and forts on the map while wiping out hoards of enemies and slowly take control of a chaotic and difficult map by thinning the numbers and completing side quests. You get a real feeling of satisfaction after spending 20 minutes completely clearing a map of all enemies. Just seeing a fresh wave of blue on your mini-map, representing your troops, replacing the garish red from just minutes earlier. It feels good, as do many of the combos you’ll be performing to tackle enemies. Basic combos are pretty boring, but once you’ve gone into the Badge system, this game’s upgrade system, you can expand your basic combo, and get other buffs like hitting weak points harder or doing more damage to enemies with their guard up. Characters that have all of their moves unlocked just hit harder and more enemies than before, and luckily it’s pretty simple to unlock a character’s full moveset – it’s fleshing out the other badges that are tougher, requiring rarer materials. The variety of characters is what really carries this game. In battle you can switch between a small assortment of heroes, and the ability to change between them, giving you instant access to where they are on the map and of course their moveset, is wonderful. 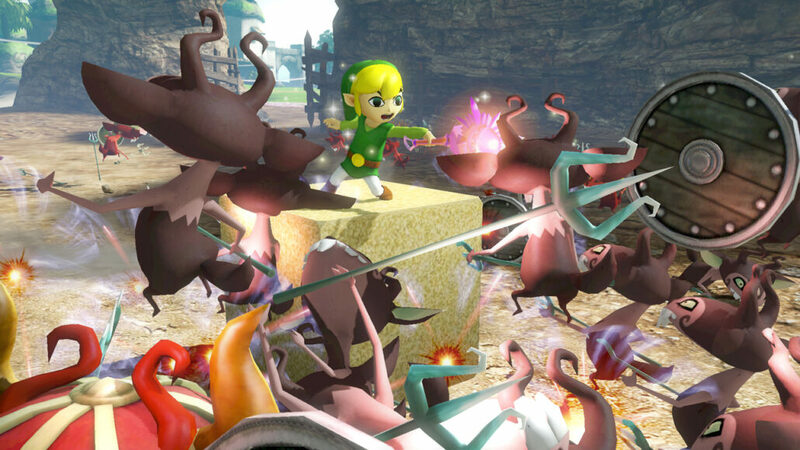 If you play with Link all the time, the game gets dull, but playing around with the roster is what will keep you engaged. The DLC is what will make Hyrule Warriors Definitive Edition worthwhile for those who have already played it if you didn’t get the season pass. New stages, new Adventure Mode maps, characters, weapons and even some new Breath of the Wild themed costumes will mix things up and definitely did for me. Though, once again, if you’ve already played with a lot of the DLC, it’s a tough sell, even if you only experienced it in low resolution with few enemies on the 3DS. Then we get to performance, and it holds up really well. There seem to be many more enemies on screen than ever before, though the frame rate fluctuates pretty heavily. It’s unlocked, so can soar up to 60FPS, before crashing around 30FPS in some scenes – this is fairly par for the course for Warriors games frankly, though it never becomes unplayable. Things never chug for a sustained period of time either, and I didn’t notice any visible screen tearing, so even though poor performance in games can sometimes make my head hurt, here it never became uncomfortable, even when the performance seemed to dip a bit harder in handheld mode. Handheld, most importantly for me, has the same number of enemies on screen as it does docked, which was my main concern. Hyrule Warriors Definitive Edition lacks the Performance/Quality Mode options seen in Fire Emblem Warriors, though unlike in that game where I found playing local multiplayer in Quality Mode to be borderline unplayable, I never had that problem in Hyrule Warriors, even when playing split screen, and the resolution appears to be better than what FEW’s Performance Mode was, too. Other than those points, it’s pretty much the same game you remember. A pretty decent variety of stages and designs, some excellent rock-inspired remixes of classic Zelda tunes and some more somber ones too. Some great Zelda-infused mechanics, such as collecting and using items in battle to counter certain enemy attacks, a few giant boss monsters like King Dodongo and Gohma, and of course massive hoards of petty mobs to chew through. Having said that, when it comes to the giant boss monsters, I’m not sure they fit well into Hyrule Warriors Definitive Edition. I’d forgotten, but they really break up the swift pace of battles, in a bad way, forcing you to wait until they decide to use a move you can counter, which can sometimes happen a lot, or sometimes they’ll just wait for minutes at a time without using it. First encounters are cool, but repeat encounters are annoying at best.